Medical marijuana is growing and dispensaries are ready to construct. This means we are just a few months away from marijuana being available to patients. Already 20 of the 32 dispensaries have paid the $15,000 fee and posted a $100,000 performance bond, allowing them to start construction. The Medical Marijuana Commission is getting ready to send out several more letters of intent to award licenses to sell marijuana. 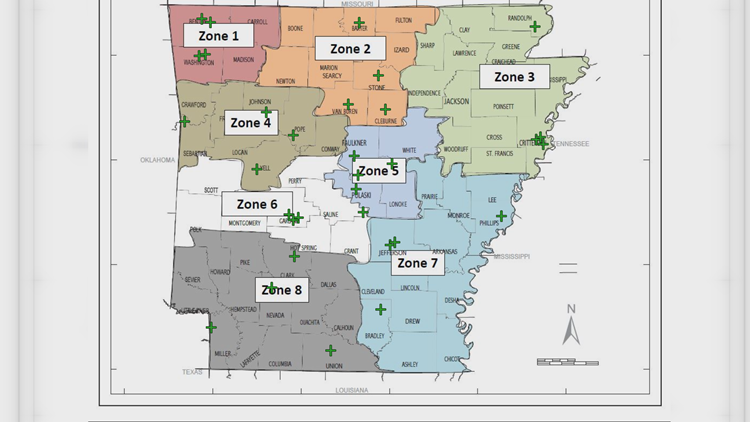 In Central Arkansas, dispensaries are set to go in Little Rock, Sherwood, Conway, Russellville, Ward, Hensley, two in Pine Bluff, and three in Hot Springs. Several companies had top scores in multiple zones. They had to choose one, which opened up spots for other dispensaries. Those which have recently moved to the top four in a zone, should expect a letter of intent for a license from the alcoholic beverage control board this week. Then, they'll have seven days to pay. Bold Team Cultivation in Cotton Plant is the first of the five cultivation facilities to begin growing marijuana. Now, a second facility is ready for inspection. Once approved, Osage Creek in Berryville will plant seeds in the ground. Approved patients should receive their marijuana patient I.D. cards in mid-February. The drug is expected to be available by April. Here are the top scoring dispensaries. Several still must pay their fees, and some have yet to receive their letters of intent.